I can honestly say that I had no intention of taking part in Meatless Monday until after I ate breakfast this morning. And truth be told, it wasn’t until I started craving lunch and brainstorming for dinner (this all happens about 30 seconds after I finish breakfast each day) that I realized that none of my craving or brainstorming involved meat. So Meatless Monday it became. For breakfast, I had some of hubby’s leftover potatoes from grilling out last night. Yes, those potatoes are hash browns, but when cooking on the grill, he just throws them into a tinfoil pack along with some butter and Lawry’s season salt. He doesn’t eat them like hash browns at all. 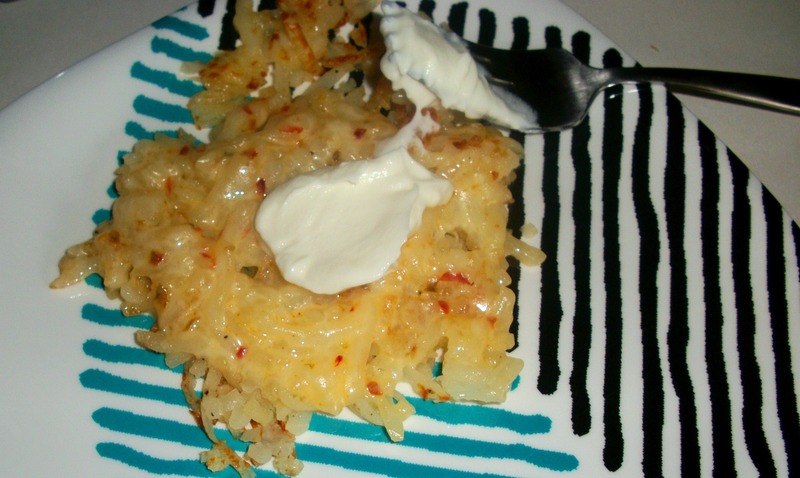 But with the leftovers, I threw them in a pan to get a little crispy, melted a piece of pepperjack cheese on top and finished it with a dollop of light sour cream. Certainly not the most filling or nutritious breakfast but it did the job. I worked a quick shift today and had some stuff I wanted to get done around the house afterward, so I just brought home some veggies and hummus for lunch. 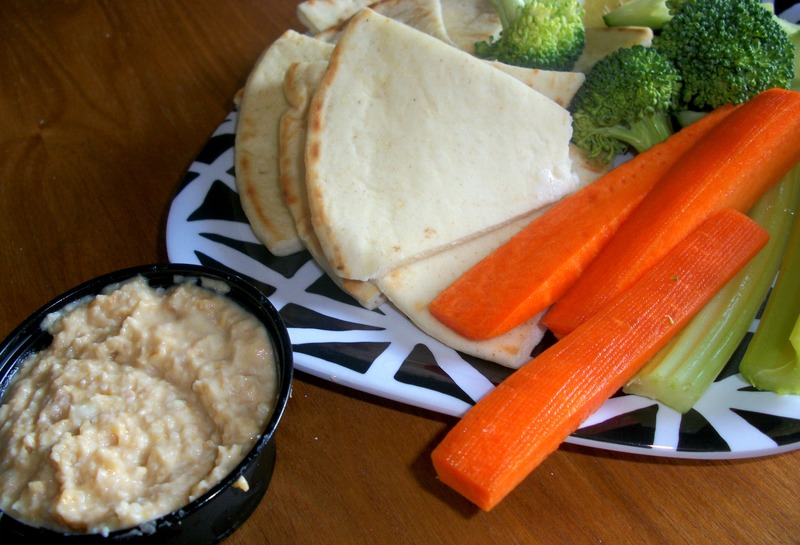 This hummus was the first I ever tried and nearly forced myself to eat it. I used to see older, “cooler” co-workers eating it as a snack before or after work and thought it looked SO good but when I tried it, I just didn’t like it. Apparently I wanted to be like the cool kids so I kept trying. I don’t know what happened but one day I had my hummus breakthrough and I’ve never looked back. It is so garlickly that it should be straight up illegal to speak to people after consuming it but it is totally worth the dragon breath. You know what’s strange? 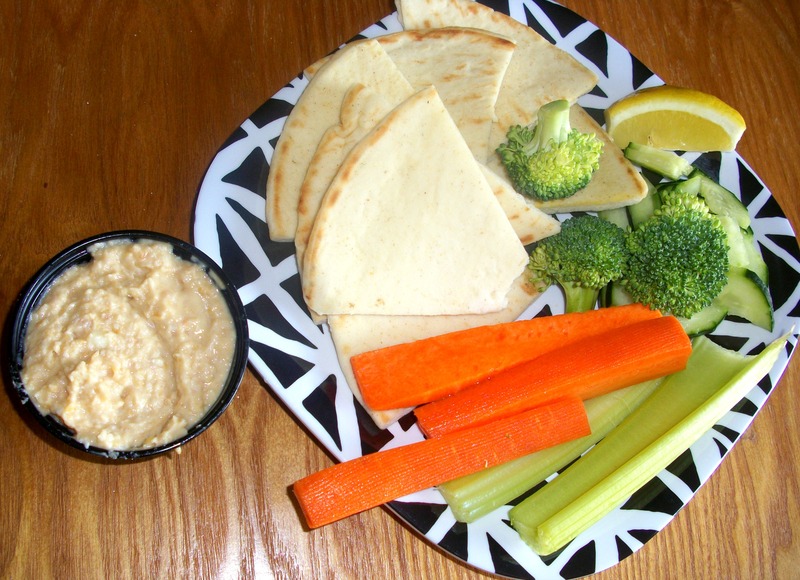 As much as I love this hummus and all of the vegetables shown here, the only veggies I actually eat with the hummus are the carrots and cucumbers. I love making little cucumber/pita/hummus sandwiches. The rest of the veggies I just eat straight up, I guess I just don’t love the flavor combos. I had been brewing up my dinner recipe all day, bouncing ideas off of my co-workers. 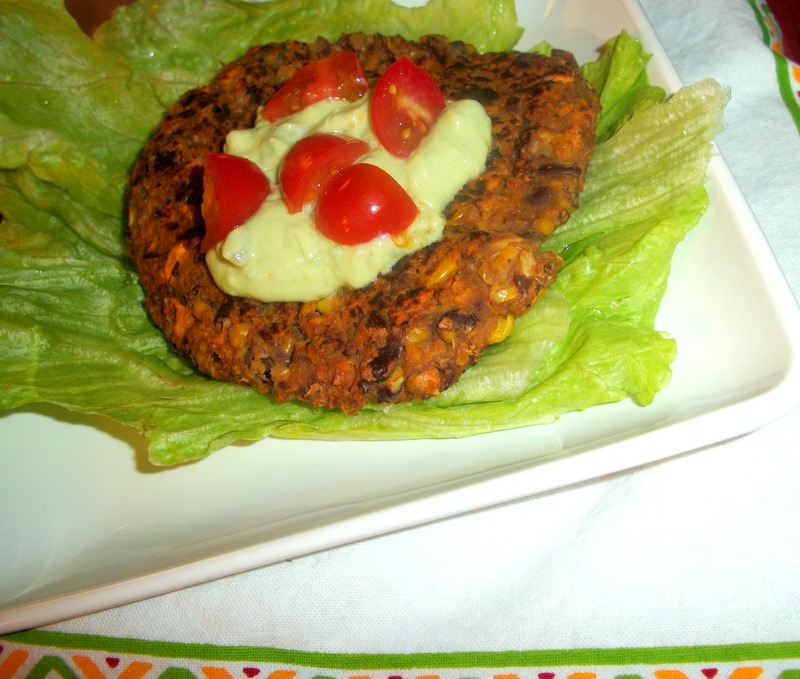 I knew I wanted a black bean and corn burger but I wasn’t sure exactly what else it would need. This is what I figured out. 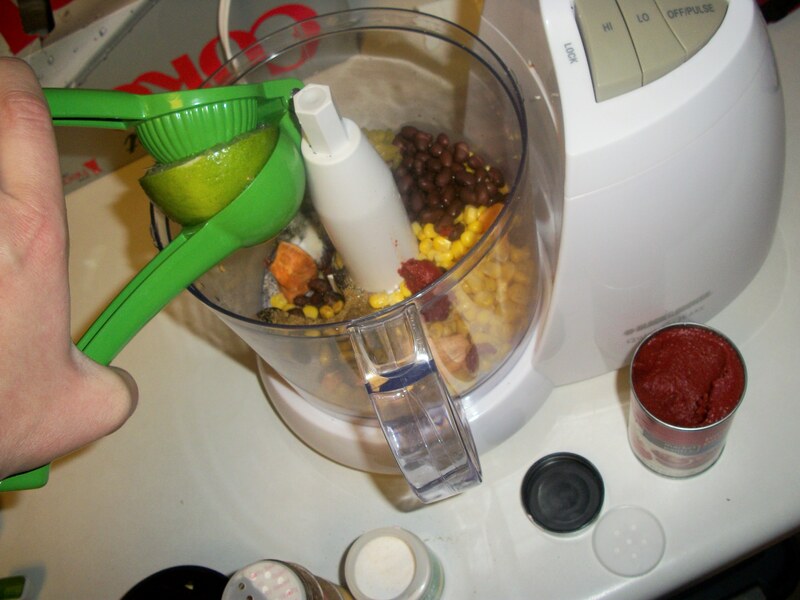 -Add half of the black beans (reserving other half for later) and all other ingredients to a food processor. Pulse until ingredients are incorporated but chunky. Do not process until smooth, this will keep the burger from sticking together. -Mash the other half of the black beans, then combine with the processed mixture. Use your hands, you know you want to. *I chose to mash part of the beans so that they would help the mixture stick together better. Mashed beans work better as a binder than fully processed beans. 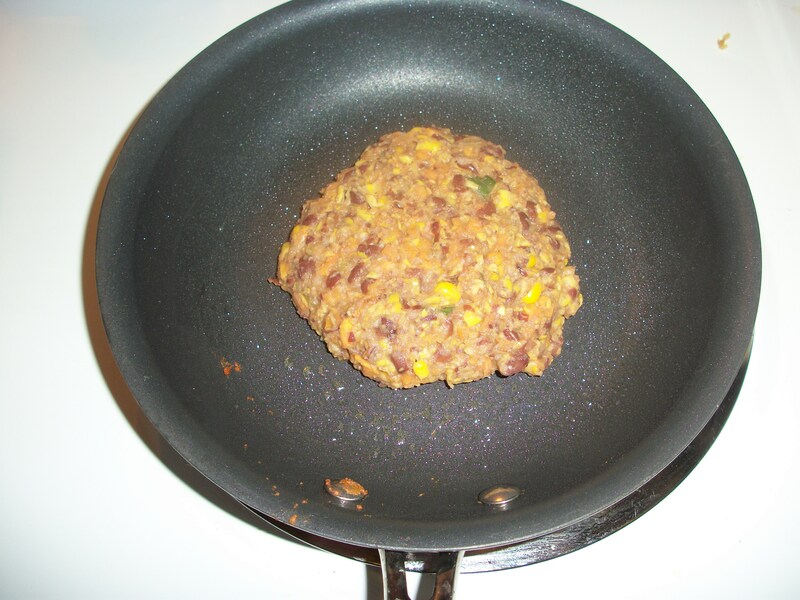 -Form mixture into two patties and cook over medium heat in pan sprayed with non-stick spray. -Cook for 2-3 minutes each side, flipping carefully. 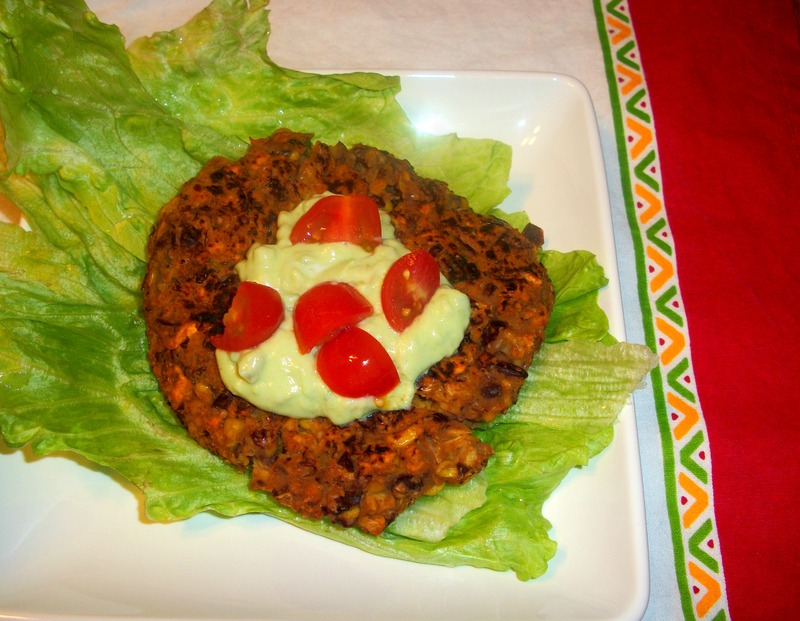 -Top burger with Avocado Cream and enjoy on lettuce, bun, or whatever you choose! Directions:-Combine all ingredients in food processor on high until smooth or desired consistency is reached. This burger was seriously good. It was all quite easy to throw together as well. I was worried the burger would fall apart as other veggie burgers I’ve made have, thus incorporating the tomato paste as sort of a binding agent. Plus, now that I know about Iowa Girl Eats tomato paste trick, I’m not so afraid to use a little bit of the pasty stuff every once in awhile. I had no problems with this burger falling apart, I had no problems eating it, and I will have no problem eating the other one for breakfast in the morning. In fact, I can’t wait! I realize black beans and corn generally come in 15oz cans so you may be thinking that I wasted the remaining 1/2 cup or so. No no, I have a plan for those leftovers for lunch tomorrow. And you may also be thinking, but what about that other half of the avocado? Well, I have a plan for that too. What is that plan, you may be thinking now? Well, I guess you’ll just have to come back tomorrow and find out. Just like in the soap operas. Muhahaha! Except, let’s be real here, you can tune into a soap opera a full year later and they’ll still be on the same story line. 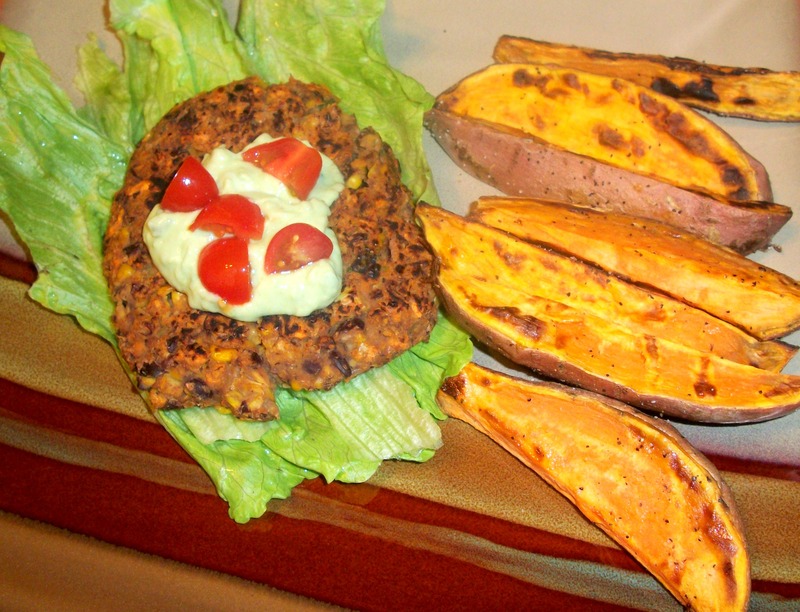 Until then, sweet dreams of this tasty burger that I devoured enjoyed with sweet potato wedges (Yes, that’s where I used the other 3/4 of my sweet potato. –Cut into wedges, mist with olive oil, sprinkle with salt and pepper, bake at 400 on foil-lined baking sheet for 30 minutes, flipping half way through). Also, I dipped the wedges in the extra avocado cream, which will make a great dip for just about anything. 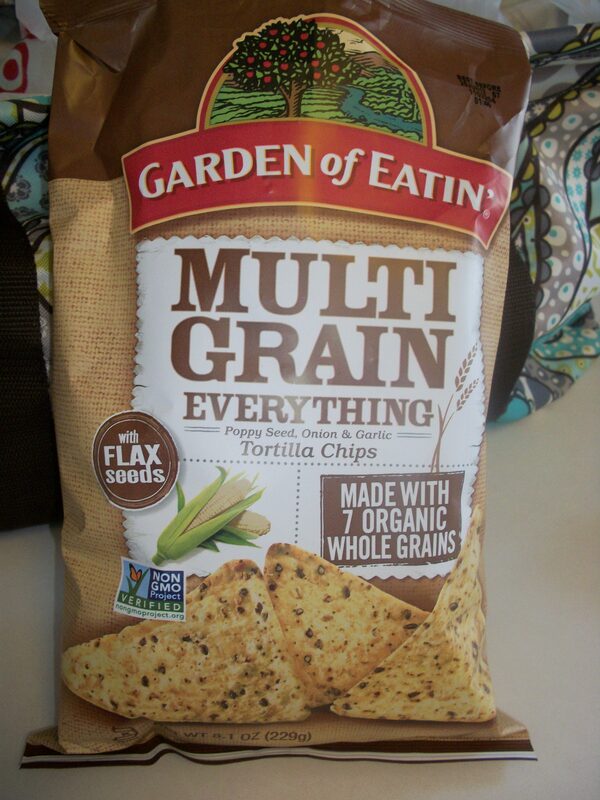 Garden of Eatin’ Multi-Grain Everything Tortilla Chips with Flax Seed, I’m lookin’ at you. You WILL be dipped in this avocado cream. Hope you had a fabulous Monday!! Next Post What I Ate…Tuesday? ?